Advocacy and diplomatic discussions started again last week with the opening day of the UN General Assembly First Committee meetings. These meetings end on 6 November 2012 (Election Day in the United States), and follow-up the failed United Nations (UN) Conference in July to formally negotiate by consensus a legally binding Arms Trade Treaty (ATT). Contrary to prevailing reportage and opinion, the UN ATT Conference was less a failure in diplomacy, or a victory by the firearms industry and the National Rifle Association for that matter, than it was the result of abortive advocacy lead by the UK-based Control Arms campaign and its unrealistically expansive vision for a more extreme trade treaty than consensus could sustain. The Control Arms vision for the ATT encompasses 14 specific treaty issue areas under three categories: Scope, Transfer Criteria, and Implementation. Scope issues areas include Ammunition, Brokering/Dealers, Other Conventional Weapons, and Small Arms/Light Weapons. Transfer Criteria issue areas include Armed Violence, Corruption, Gender-based Violence, Human Rights, International Humanitarian Law, and Socio-Economic Development. Implementation issue areas include Final Provisions, Implementation, Verification, and Victim Assistance. Reaching consensus during the UN ATT Conference was certainly possible, and potentially a constructive endeavor for all nations from an interest point of view. But consensus was not likely because a lot of countries thought aspects of the emerging ATT were potentially threatening to national sovereignty for example. Nonetheless, the popular narrative is that the United States killed the Conference when it asked for more time to consider the draft treaty on the final day of the Conference. This expedient and seemingly anti-American explanation doesn’t stand up to scrutiny, especially when you put the Conference into context and examine the armstreaty.org database about opposition to the ATT. The relevant historical context for what happened at the Conference extends back to at least the creation of the International Action Network On Small Arms (IANSA) in 1999. Important context also includes the recorded debate between the leaders of IANSA and the National Rifle Association in 2004 along with several formal rounds of preparatory negotiations since 2009 for example. This is admittedly a lot of history for one to casually consider, but after surveying this period, and listening to diplomats based in Geneva, a pattern of overdone, unfocussed, and ultimately counterproductive advocacy emerges. This appears to be due, at least in part, to self-inflicted wounds from years of overselling positions and distractive issue framing, which, in turn, appears to have damaged their credibility and cause. Ultimately, humanitarian groups, led by an unraveling Control Arms coalition, sabotaged consensus for an ATT by pushing diplomats too hard for far too much and provoked dispositive sovereignty concerns across the Asia, Latin America, and the Middle East in addition to the United States. Not only was there no consensus on the final draft ATT as a whole in those final days of the Conference, but there remains no consensus for any of the 14 treaty elements Control Arms continues to advocate for, and opposition to them is growing. This can be evidenced in detail on armstreaty.org. 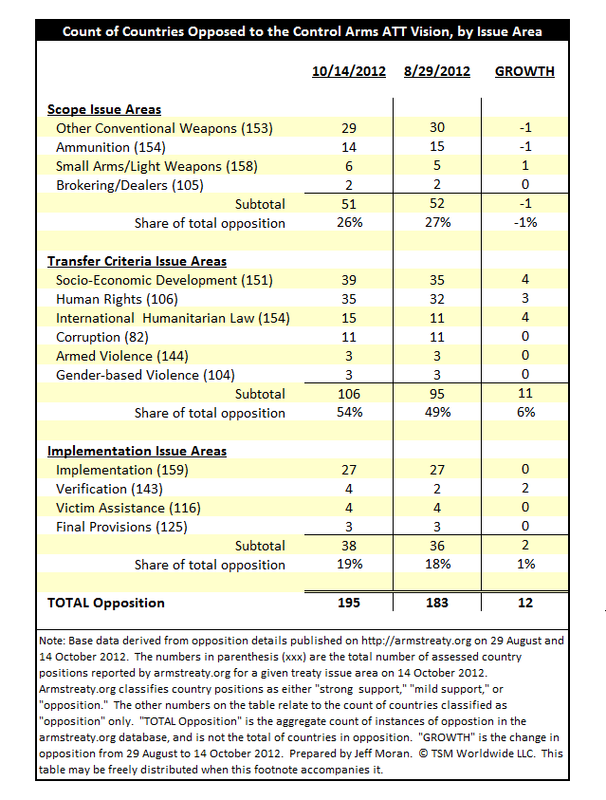 While the data on armstreaty.org are not an official record of country delegation viewpoints during the final days of the ATT conference, they serve as a useful proxy indicating size, scope, and direction of opposition to the ATT as Control Arms envisions it. Clearly, the most widely opposed ATT issue areas fall under the creation of transfer conditionality / restrictive criteria on the international transfers of arms. The most objected-to transfer criteria remain those related to Socio-Economic Development and Human Rights. Thirty-nine and 35 countries oppose these criteria respectively, the US not being among them. The US opposed only three provisions cutting across treaty scope and implementation issue areas only. 1. There are 195 total instances where a country opposes an aspect of the envisioned ATT (consensus requires zero instances or at least a willingness to no longer publicly oppose, and Control Arms attributes just 3 of these 195 to the US). 2. There is no consensus for any of the provisions across the all three treaty issue area categories (Scope, Transfer Criteria, and Implementation). 3. Total opposition to the Control Arms vision has actually grown in the months after the UN ATT Conference (by 12 net instances, or 7%). 4. There is a two-way tie for issue areas experiencing the fastest opposition growth: Socio- Economic Development and International Humanitarian Law (both together account for 2/3 of the growth in total opposition). 5. The most-opposed category of treaty issue area is Transfer Criteria (54% share of total opposition) and opposition has grown (by 11 instances, or 6%, since 29 August 2012). 6. The most-opposed treaty issue area by country count is Socio-Economic Development (39 countries opposed). 7. The most-opposed issue area by percentage of countries opposed (relative to total number of countries assessed) is Human Rights (33%). 8. The least-opposed provision by country count relates to including the activities of arms Brokering/Dealing within the scope of the ATT (2 countries opposed). 9. There is a three-way tie for the least opposed provisions by percentage of countries opposed (relative to total number of countries assessed): Brokering/Dealers, Armed Violence, and Final Provisions (all at 2% opposed). Rightly understood, Control Arms’ own data help to correct the false narrative about why the UN ATT Conference failed to reach consensus this summer. Such data clearly show that the prospects for consensus were grim at best, and are getting worse. The data also suggest that even if the US enthusiastically embraced the final draft ATT, other countries would have probably worked together to prevent consensus anyway. It is not a giant leap in logic to see that Cuba, Iran, or Venezuela (countries that each oppose many more treaty provisions than the US does) probably would have killed consensus themselves, especially if the United States indicated it was going to sign the treaty. Venezuelan President Hugo Chavez, for one, faced an election within months. Being the consensus breaker would have surely boosted President Chavez’ domestic political standing, and perhaps his image as a regional guardian against outside meddling. In conclusion, UN ATT Conference died from lack of consensus. This death was due less to failed diplomacy, or pressure by the firearms industry and gun rights groups, than it was the result of many years of abortive advocacy lead by an unraveling UK-based Control Arms campaign. Control Arms’ broad vision for the ATT was more extreme than consensus could sustain. Ultimately, humanitarian groups sabotaged consensus for an ATT by pushing diplomats too hard for far too much and provoked dispositive sovereignty concerns across the Asia, Latin America, and the Middle East in addition to the United States. Perhaps a more extreme version of the ATT will be born outside the UN altogether. If this happens, it would likely share a destiny not unlike like the 1997 Ottawa Treaty banning anti-personnel landmines. Ottawa was born outside the UN because an anti-personal mine ban did not get traction inside it. Russia, China, and the United States have still not ratified or acceded to the treaty. And while 33 other states have not ratified or acceded to the Ottawa Treaty either, supporters argue that the treaty is emerging as an international norm on its way to acquiring the force of international law over time. Most likely, within a year, the UK, the lead country responsible for putting the ATT on the UN agenda in 2006, will introduce the draft ATT to the UN General Assembly and seek signatures from countries willing to sign it as is. Unfortunately, regardless of what course the ATT takes, moving forward with an ATT not based on consensus will only serve to divide the international community. As the specter of major conflict looms larger over volatile regions of the world, more division is now the last thing the international community needs. Jeff Moran, a Principal at TSM Worldwide LLC, specializes in the international defense, security, and firearms industries. Previously Mr. Moran was a strategic marketing leader for a multi-billion dollar unit of a public defense & aerospace company, a military diplomat, and a nationally ranked competitive rifle shooter. He is currently studying international law of armed conflict with the Executive LL.M. Program of the Geneva Academy. Earlier this year he completed an Executive Master in International Negotiation from the Graduate Institute of Geneva. Mr. Moran also has an MBA from Emory University’s Goizueta Business School and a BSFS from Georgetown University’s Walsh School of Foreign Service. The First Committee “deals with disarmament, global challenges and threats to peace that affect the international community and seeks out solutions to the challenges in the international security regime.” It meets in October each year. See http://www.un.org/en/ga/first/ for more information about this. Opening day official statements can be found at http://www.un.org/News/Press/docs/2012/gadis3453.doc.htm. Oxfam International has a blog associated with this series of meetings at http://blogs.oxfam.org/en/blogs/12-10-12-fighting-arms-trade-treaty-un-general-assembly. All links last accessed 15 October 2012. The key deliverable from the UN ATT Conference was an unsigned final draft treaty dated 26 July 2012. This draft is available at http://www.un.org/disarmament/convarms/ATTPrepCom/Documents/PrepCom4%20 Documents/PrepCom%20Report_E_20120307.pdf. Last accessed 14 October 2012. The Control Arms Campaign is the flagship civil society campaign advocating for an ATT. It started-up in 2003 as a powerful collaboration among the UK offices of Amnesty International, the International Action Network on Small Arms (IANSA), and Oxfam International. In addition to having been funded by a few governments, Control Arms has support from under a 100 mostly Western advocacy groups yet views itself as a “global civil society alliance.” There are many different humanitarian groups and campaigns, but Control Arms is the biggest. Another campaign, the Campaign Against the Arms Trade, is loud and vocal, but is not taken seriously by governments because it advocates for a total ban on the Arms Trade. Armstreaty.org is the leading ATT negotiations tracking website created by the Control Arms campaign and the Women’s International League for Peace and Freedom. http://armstreaty.org/mapsstates.php. Last accessed 15 October 2012. Such views underpin many official views found the May 2012 official UN document “Compilation of Views on the Elements of an Arms Trade Treaty (A/CONF.217/2.” http://www.un.org/ga/search/view_doc.asp?symbol=A/CONF.217/2. Last accessed 15 October 2012. Here are links to press releases from Reuters, Oxfam, Amnesty International, and Control Arms: http://www.reuters.com/article/2012/07/27/us-arms-treaty-idUSBRE86Q1MW20120727, http://www.oxfam.org/en/pressroom/pressrelease/2012-07-28/battle-arms-trade-treaty-continues-governments-opt-delay-final-dea, http://amnesty.org/en/news/world-powers-delay-landmark-arms-trade-deal-2012-07-27, and http://www.controlarms.org/battle-continues. Sources last accessed 14 October 2012. Author conducted interviews with numerous diplomats and country delegates in and around the Geneva-based UN disarmament community in 2012. A consistent portrait painted by them was that Control Arms campaigners exhibited a profound lack of collective unity and focus, and that messaging was redundant, superficial, grossly insufficient to help in a technical or practical sense, and largely amounted to a waste of time even for diplomats and delegates who were sympathetic to their cause. Additionally, Control Arms Campaigners undermined their own efforts by insisting on adding controversial provisions to the treaty, such as Victim Assistance, which made consensus all the more unattainable. Control Arms is described as “unraveling” because, by 2012, Control Arms had essentially disintegrated as a cohesive coalition. This appears to be a key reason for a lack of focus in campaign execution. The proximate cause for this appears to be a case of disintegration due to interpersonal problems and hubris among its leaders, and organizational self-interest. Amnesty International essentially left Control Arms to pursue its own agenda in 2011. This information was corroborated by interviews with several diplomats and an interview with a professional arms trade researcher with direct knowledge of the situation and people concerned, May 2012. TSM Worldwide LLC conducted a comparative analysis of the website using snapshots taken 29 August and 14 October 2012. The only Scope issue area the US objected to was the inclusion of ammunition in the treaty. The implementation issue areas the US objects to are Final Provisions and Victim Assistance. Source: armstreaty.org. Last accessed 14 October 2012. The graphic represents outright country opposition to given issue areas as gauged by Control Arms only. The totals at the bottom of the table are counts of distinct instances of country / issue-area opposition and do not reflect the count of countries opposed to the ATT as a whole. One group is Handicap International, sponsors of the Campaign to Ban Landmines and co-winner of the 1997 Nobel Peace Prize. http://en.handicap-international.ca/Ottawa-treaty-good-news-and-bad-news_a186.html Last accessed 1 October 2012. Republication and redistribution are authorized when author Jeff Moran and linkable URL http://tsmworldwide.com/consensus-killed/ are cited. Following a stunning last-minute derailment of the United Nations’ highly-touted international Arms Trade Treaty (ATT) negotiations, global gun control proponents are expected to bring the issue back again in the fall. That was the forecast from Julianne Versnel with the Second Amendment Foundation and International Association for the Protection of Civilian Arms Rights (IAPCAR). She was at the UN when the ATT meltdown occurred, as was Alan Gottlieb, chairman of the Citizens Committee for the Right to Keep and Bear Arms. Both were instrumental in creating IAPCAR, which now has member organizations all over the globe. The treaty talks essentially imploded in the final 24 hours when ATT proponents did not produce a final draft of their proposed treaty until late in the afternoon of the day prior to a scheduled vote. Another problem was that the document was printed only in English, leaving many delegates from non-English speaking nations in the lurch because they had no document to study. The US delegation and other delegations simply did not have enough time to study the proposal, and there were problems with it even if they had. The final draft came barely 48 hours after an initial document was circulated that met with tepid reactions from several delegations including North Korea and Iran. In a press release, Gottlieb called the proposed treaty, “a blatant attempt to negate the recent Second Amendment court victories we’ve had in the United States, and to get around Second Amendment protections.” A coalition of global gun control organizations has been pushing for the most extreme language and tenets in the proposed treaty, and now they are apparently back at the drawing board trying to come up with language that will be acceptable. That group includes International Action Network on Small Arms (IANSA), Oxfam International and Control Arms. The latter group was apparently responsible for a handout depicting their vision of the treaty provisions highlighted in Olympics-style rings, timed with the opening of the summer games in London. Two of those items were “Arms and Bullets” and “Global Standards Over National Views.” The former alluded to privately owned firearms, and the latter was a veiled but direct threat to the Second Amendment, Gottlieb said. Various gun rights organizations, including CCRKBA and the National Rifle Association, had been lobbying against this treaty for weeks. If the Obama administration signs it, the document must still be ratified by the US Senate, and after intense lobbying by the National Rifle Association, that doesn’t seem likely. Now, with the national elections looming, President Barack Obama may be painting himself into an ever-tightening corner with American gun owners, if the treaty comes up again in October as anticipated. Newt Gingrich gave a rousing speech at the NRA Convention supporting international gun rights.